Cattle smuggling on the border is estimated to be worth $500 million annually. On October 19, 24-hour news channels repeatedly flashed a video showing a Union minister of state being assaulted by alleged cattle smugglers and TMC supporters in Asansol, Bengal. This is probably the first occasion when a politician faced the ire of alleged cattle smugglers. And I hope the incident will sensitise politicians about what BSF troops face day and night while deployed to guard the India-Bangladesh border. Cattle smuggling on the border is estimated to be worth $500 million annually. Every night, when troops go out to patrol the borders in groups of three-four, they are faced with hundreds of cattle smugglers armed with sharp-edged weapons like "dah" and "bhala", and country-made firearms, pushing thousands of cattle to Bangladesh through the riverine border. Heavily outnumbered, the troops face lethal attack if they try to prevent them. Similar scenes are replete on fenced borders where groups of smugglers attempt to cut the fence at several places and the BSF patrols along but is not able to prevent all such attempts in spite of best efforts. Smugglers attack and lynch troops with impunity, whereas the troops are compelled to operate with one-hand tied as they are discouraged from opening fire to prevent the smuggling. The new mantra is "use of non-lethal strategy" to prevent smuggling. The troops who are trained with the philosophy of "ek goli, ek dushman" have for the last few years been operating with pump action guns, stun grenades and chilli grenades. The result is that smugglers have become emboldened and injuries and causalities to BSF troops have seen continuous rise over the last few years; whereas the same for smugglers, both Bangladeshi and Indian, has seen a sharp decline. Cattle seized by the BSF during operations is handed over to customs for auction. Only smugglers purchase these cattle and the very next night, again attempt to send them across. The entire system is well organised. 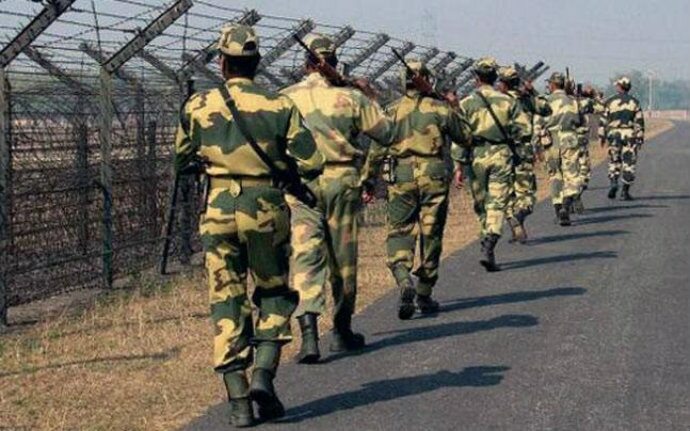 Criminals on both sides are continuously in touch and keep tracking the movement of BSF patrols. On the Bangladeshi side, smuggled cattle is taken directly to Bangladesh Border Guards (BGB) who register them and allow entry after taking a specified amount as tax. The India-Bangladesh border is thus a dangerous place for ordinary people. Having attended several DG-level and IG-level conferences with BGB, I have realised that the deaths of Bangladeshi criminals whom they prefer to call "cattle traders" is the sourest point with them. Even the "Land Boundary Agreement" implemented in 2015 or the proposed Teesta water agreement pales into insignificance when compared to this. Implementation of non-lethal methodology was encouraged keeping the sensitivities of Bangladesh in mind and in pursuance of government policy of improving relations with the country. Bangladeshi economy to a great extent is dependent on meat and leather exports which are mainly dependent on the cattle brought in from India illegally. The cattle population of Bangladesh is not enough to sustain demand of their industry. On other hand, India is a cattle surplus nation. According to estimates, India has the second largest cattle population in the world after Brazil. However, we do not export cattle. Therefore, the simple principle of demand and supply applies and cattle from as far as Haryana, Rajasthan, Himachal Pradesh, Haryana, Uttarakhand, Madhya Pradesh, Uttar Pradesh and Bihar is brought for smuggling. Cattle is cheaper in these states and owners get good money - an old cow costing Rs 500 in the hinterland can fetch ten times the price in the border areas of Bengal, from where smuggling takes place. Taking a pragmatic view of the matter and perhaps permitting export of cattle will therefore be a win-win situation for everyone. Firstly, crime at the borders will reduce drastically and they will be much safer. It will also provide border residents with legal employment opportunities to organise cattle trade, something they do illegally right now. The most significant outcome would be improvement in relations with Bangladesh. Cattle smuggling will stop and casualties of Bangladeshi nationals on the borders will be eliminated. Moreover, with cattle from India being critical to Bangladesh's economy - they will be ever grateful to India for the gesture which will be economically beneficial to us as well. Thirdly, India doesn’t have enough grazing fields for its cattle population. Further, with modernisation of farming, a lot of surplus cattle is an economic burden on farmers. Plain reading of the Directive Principles in Article 48 indicates that the state is required to enact laws to prevent "slaughter" of cattle. Export is neither banned nor recommended to be banned. States except Bengal and Kerala have enacted laws to ban slaughter. In spite of the laws, India is the biggest exporter of beef in the world since 2013 and is the fifth-largest consumer. Therefore, permitting export of cattle to Bangladesh will be a pragmatic step towards further improving relations with Bangladesh. It is also economically sound for both countries and beneficial to Indian farmers.